The beauty of owning a large cell phone like the iPhone 6s Plus is that it can double as a workstation. 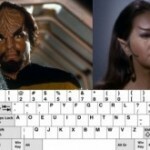 Yes, I’m writing this post on my iPhone using a combination of Dragon’s Dictation and the portable keyboard. It’s amazing what a phone can accomplish nowadays. The keyboard must be full-sized. I’m not looking for a scaled down, mini keyboard. Touch typing on those are almost as difficult as touch typing on screen (at least for me). It must be able to fit in my purse. In other words, I don’t want to carry a briefcase around to accommodate a large keyboard. It must be wired. 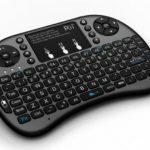 I’ve had bluetooth keyboards before and I’m not very impressed with them. I’ve found them to be a bit quirky. I don’t want to power down my device and keyboard in order to correct quirky bluetooth keyboard behavior. It’s frustrating and a time waster. Having these requirements in mind I went searching around for the appropriate keyboard. I ran into a little difficulty because most of the truly portable keyboards were wireless. After running into a few dead ends I came up with a bright idea. Why not purchase an adapter that will convert my micro USB keyboard into an iPhone 8-pin lightning connector keyboard. Sounds easy, right? Either I was naive in thinking it could be done or I purchased the wrong adapter, but it didn’t work. I picked up a few adapters on Amazon, attached them to my keyboard, plugged it into my iPhone and nothing. It’s a good thing I didn’t spend a lot for the adapters. I was back to square one. 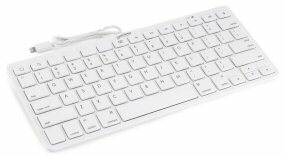 I was pleased when I found an iPad compatible full-size keyboard made by Devicewear. It’s smaller than a full-sized keyboard, but the keys are appropriately spaced which makes it comfortable to touch type. It’s also sturdy and will hold up to the jostling around in my purse. The keyboard itself measures 11.25” by 4.75” (I carry a large purse). It does not not fold in half like so many of the portable keyboards do, but I’m okay with that. The iPhone is my first jaunt into Appleland so I’m getting used to the keyboard. It’s slightly different from a Windows keyboard in that it has two command buttons, a single key that serves as delete and backspace (makes sense) and missing all the Windows F Keys. Some of the keys on the top row are self-explanatory, a few of them are blank, and a couple of them have me stumped. I’ll figure them out eventually. The more I use the keyboard, the more comfortable I’ll be. Now that I’ve secured a functioning keyboard. The next challenge was finding a word processing app. On my PC I use Word, but that’s not an option for me. It appears I’d have to pay a monthly fee to use Microsoft’s suite of products on the iPhone. I didn’t want to do that. On my tablet I used KingSoft office and had intended to use it on the iPhone, but there was one deal-breaking problem. The KingSoft’s word processing window would only display in portrait orientation. Portrait orientation is fine for larger tablet screens, but with a screen width of less than 3”, portrait is tough for typing articles. Landscape orientation gives almost 5” of screen width, which is manageable, but the 3” is just too tight. Not only that, the OttterBox Defender case holster props the iPhone in landscape orientation. I don’t want to purchase another item for propping the phone up right, especially when portrait orientation isn’t how I want to type. That pretty much sums up my search for the right word processing app, one that would allow me to type in landscape on my iPhone. I had it all the time, Google Docs. Yes, that’s right, the free Google service. I discovered this after researching Pages (Apple’s app which costs $9.95), Kingsoft (as mentioned above), Word (for the cost of $69 per year) and a few others. Imagine my glee when I downloaded the Google Docs app, turned my phone sideways and was able to type away… in landscape mode. All I need is a basic word processing app. Nothing too fancy, just enough for me to write my articles, edit them and share with my daughter (who gives them a once over). Since using the Google Docs app, I’ve not used my PC’s version of Word. I’ve been using Google Docs exclusively on my PC, tablet and now iPhone. The final test as to whether or not I could use my iPhone as a workstation was the ability to print from the phone. Editing work from a small screen is less than desirable. It can be done, but I much prefer printing it out, grabbing a red pen and marking up the copy. As such, I had to figure out how to print from the phone. I didn’t want to email work to the PC for the PC to print. Might as well learn to take full advantage of the current technology. As it turns out, printing was simple. While working on a document, I accessed Print preview. From Print preview, I had an option to Print. From the Print menu, I could use either AirPrint or Google Cloud Print. Of course, those two options sent me on a quick Google search diversion. My diversion taught me that AirPrint will print to any ePrint enabled HP printer on my network. My old HP LaserJet is not ePrint enabled, so I scratched that option. With Google Cloud Print I was able to add my old classic local HP printer to Google Cloud Print. The instructions were simple. Once I added the printer, all I had to do was choose it as the destination for printing. Very clever creating a portable workstation with your iPhone! Are you backing up what you create through Google Docs on your PC or elsewhere on the cloud? Lately I’ve been using Google Docs more and more. I like the ability to work on a document from various devices. When it comes to cloud storage, there are so many options that my head is spinning. I’ve been playing around with my options to see which one will eventually be the winner. So far, it looks like I’ll be using two cloud services, Google Drive and Amazon. Amazon for photos/videos and Google Drive for documents I’m currently working on. Everything else gets stored on my PC’s hard drive. How about you? Do you use cloud services and which one(s) do you prefer? We’re cloud averse here in the wilderness – too much chance of losing connection coupled with limited bandwidth. So we keep everything on our PCs with backup on external drives. I guess the exception is my personal blog hosted on Blogger, which I’ve thought for years I should move but can’t seem to get the gumption to do so. While I can see several advantages with cloud storage, it just won’t work for me.